Aziz Sancar attributes his award-winning success to those who collaborated with him over the years. 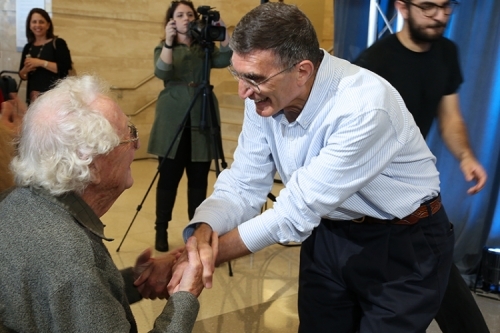 Oliver Smithies, winner of the 2007 Nobel, congratulates Aziz Sancar on his 2015 Nobel win. He never played for the national team. He had to settle for the highest honor a scientist can receive — a Nobel Prize. Sancar, the Sarah Graham Kenan Professor of Biochemistry and Biophysics in the UNC School of Medicine, earned the Nobel Prize in Chemistry this year for his work on mapping the cellular mechanisms that underlie DNA repair, which occurs every single minute of the day due to environmental factors. In particular, Sancar mapped nucleotide excision repair, which is vital to fixing UV damage to DNA. When this repair system is defective, people exposed to sunlight develop skin cancer. Also, Sancar showed that other substances can damage the nucleotide excision repair system. His work provides the crucial basic knowledge necessary to develop better treatments that protect against DNA damage, which can result in cancer. Two others also won the prize for chemistry: Tomas Lindahl of the Francis Crick Institute and Clare Hall Laboratory in Great Britain, and Paul Modrich of Duke University School of Medicine and the Howard Hughes Medical Institute. During an Oct. 7 press conference, Sancar recognized the work of Modrich and told the overflowing crowd that, for the past 10 years, he’s been nominating Modrich for a Nobel Prize without telling Modrich about it. Sancar was born in Turkey near the Syrian border and graduated from Istanbul Medical School in 1969 before working in a medical practice in rural Turkey. He earned a NATO Fellowship and worked at Johns Hopkins for two years. This is where he met Stan Rupert, a professor of molecular and cell biology. After two more years of medical practice in Turkey, Sancar decided to get his doctorate at UT-Dallas when Rupert joined the faculty at the 10-year-old university. Rupert studied light-activated bacterial enzymes; he found that these enzymes were important for repairing DNA damaged by ultraviolet radiation. In Rupert’s lab, Sancar was the first to purify and describe the bacterial enzyme photolyase, which is crucial to the UV-triggered DNA repair. “I worked very hard in graduate school,” Sancar said when asked to give advice to current graduate students. “You just have to put other things aside and sacrifice to do the work.” Fortunately for Sancar, he met fellow graduate student Gwen Boles in the lab. “We argued over the use of a piece of lab equipment,” Gwen Sancar recalled. “But we worked that out.” They became friends in the lab, two of the few to consistently work late. When they could break for dinner, they’d chat, eventually becoming more than friends and marrying. In 1977, Sancar moved on to Yale as a research associate in the department of therapeutic radiology. When he was searching for a job in 1982, UNC was the only place that offered him a position, thanks in large part to Mary Ellen Jones, then head of the biochemistry department and the first female department chair at UNC. At UNC, Sancar continued his work on DNA repair, essentially uncovering the cellular totality of one of the few major repair mechanisms our bodies use to keep cancer at bay every single day as we are bombarded with environmental factors such as sunlight and pollution, which can damage DNA. Without these repair systems, the DNA would mutate and lead to cancer. It was Sancar who also found out that disrupting nucleotide excision repair is how the common cancer drug cisplatin kills cancer cells. Sancar has made a point to thank members of his lab, singling out Chris Selby, research assistant professor, and Laura Lindsay, research associate professor, both of whom have worked with Sancar for many years and contributed to the work that earned Sancar the Nobel Prize. This past May, Sancar’s team published its most recent paper, which focused on the development of a method for finding where DNA repair happens throughout all of human DNA. The findings, published in the journal Genes & Development, offers scientists a potential way to find and target the proteins that cancer cells use to circumnavigate therapy. The benefit of this new method could be more effective and better-tolerated classes of cancer therapeutics. The work marks the first time scientists have been able to map the repair of DNA damage over the entire human genome. “Now we can say to a fellow scientist: ‘Tell us the gene you’re interested in or any spot on the genome, and we’ll tell you how it is repaired. Out of 6 billion base pairs, pick out a spot and we’ll tell you how it is repaired,’” said Sancar, who is also a member of the UNC Lineberger Comprehensive Cancer Center. Sancar is also known for his work uncovering the inner workings of the circadian clock — a group of enzymes that keep us in proper rhythm with the 24-hour day and four seasons. When we fly four or 14 time zones away, we feel awful not because we might have slept poorly on the plane, but because our cells are thrown out of whack and need time to adjust. Sancar was one of the scientists who uncovered why. His work was first featured in The New York Times in 1998, and the most recent work on the circadian clock was published in 2014. This part of Sancar’s work, which has implications for cancer care and treatments for other diseases, was so groundbreaking that it was possible this was the research that earned him a Nobel Prize. Sancar joined Oliver Smithies, Weatherspoon Eminent Distinguished Professor of Pathology and Laboratory Medicine, as the only two UNC faculty members to have won Nobel Prizes. Smithies won his in 2007. Mark Derewicz is the science communications manager for the UNC School of Medicine.